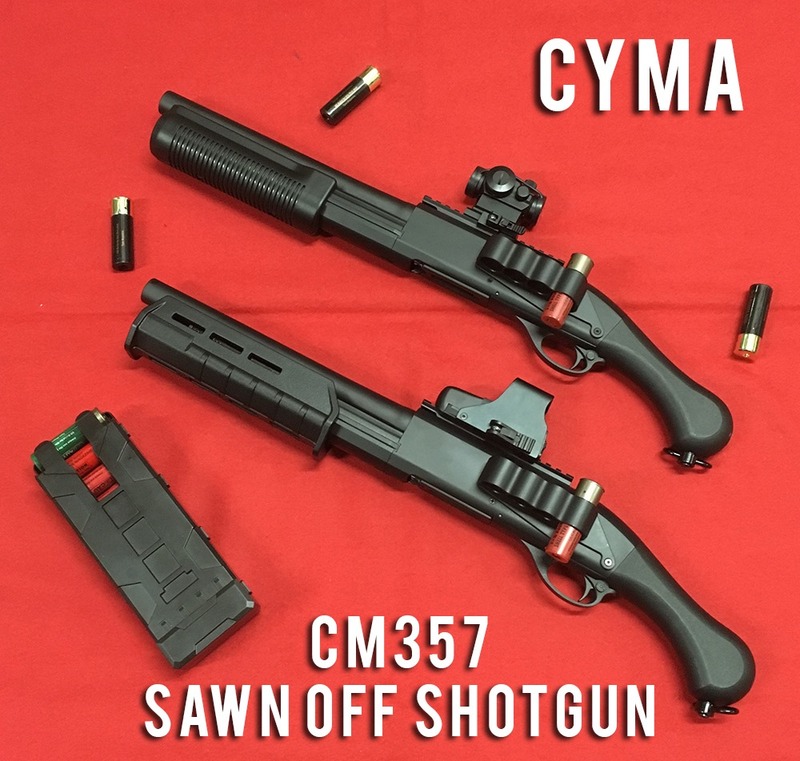 New from CYMA is the CM357 Short Shotgun! This compact Pump-Action Tri-Shot shotgun based around their 870 series of shotguns. The CM357 is a light but also robustshotgun, featuring a mostly polymer construction with some metal parts. It features a comfortable goose-neck style grip in the rear with a QD sling mount allowing you to sling it as a backup weapon easily. Alongside this the top of the weapon is railed for the addition of optics, and the gun also comes with a side mounted shell saddle to keep up to 4 spare shells on the gun itself! 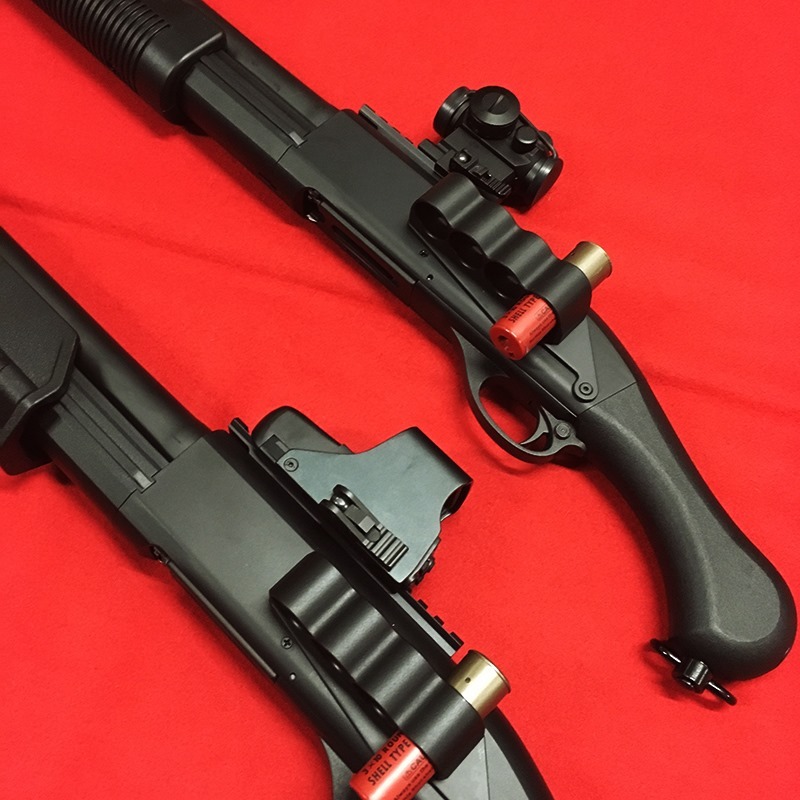 If you’ve been looking for a short but also tactical shotgun, then CYMA has the answer! 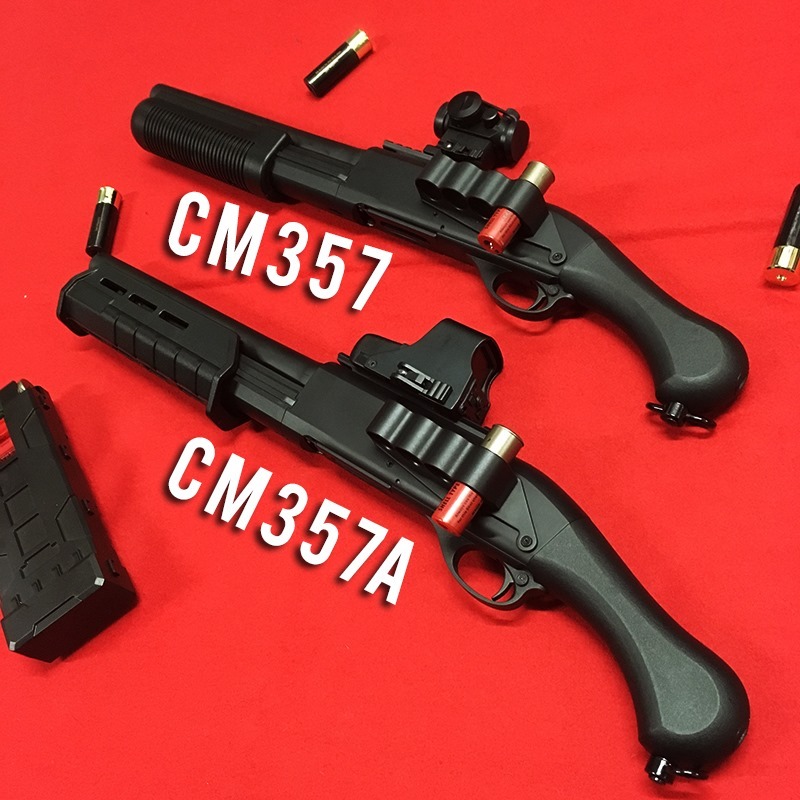 We are currently stocking standard CM357 with the classic pump handle, alongside the CM357a which features a more tactical magpul-esque pump! Both Variants measure in at63cm, perfect for use as both a primary or even a secondary weapon! Moving on from the usual Gun updates, this week we decided to shed some light on a piece of kit that has functional purposes both on and off the field – The Humble Grab Bag (Also known as the Tactical Man Bag) In store we carry a number of small/medium sized bags ideal for use both out and about every day or even for carrying kit out into the field! All 4 of our offerings come from Kombat UK! 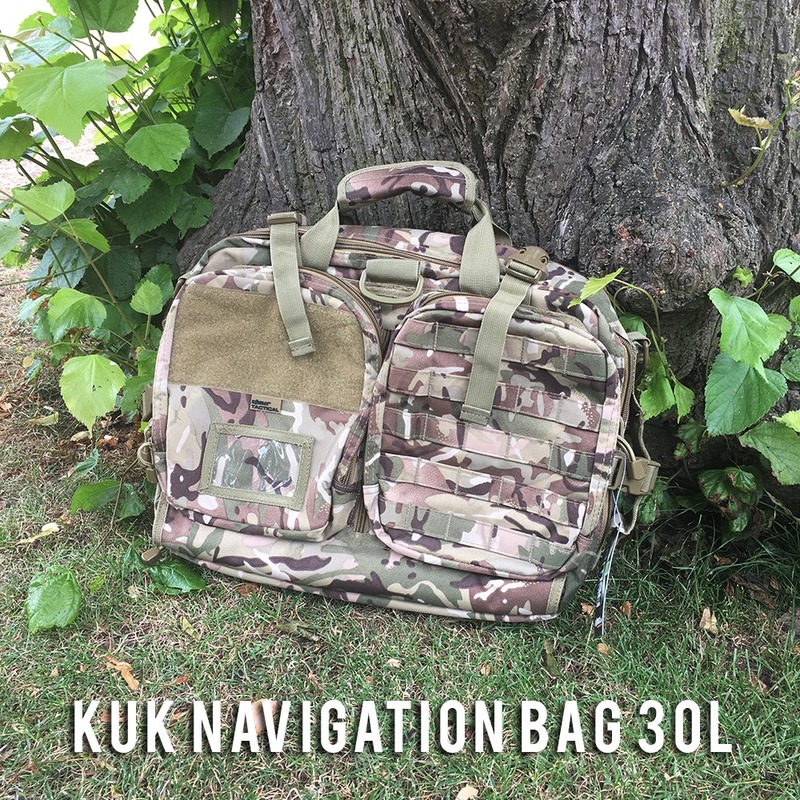 Up first we have the KUK Navigation bag! 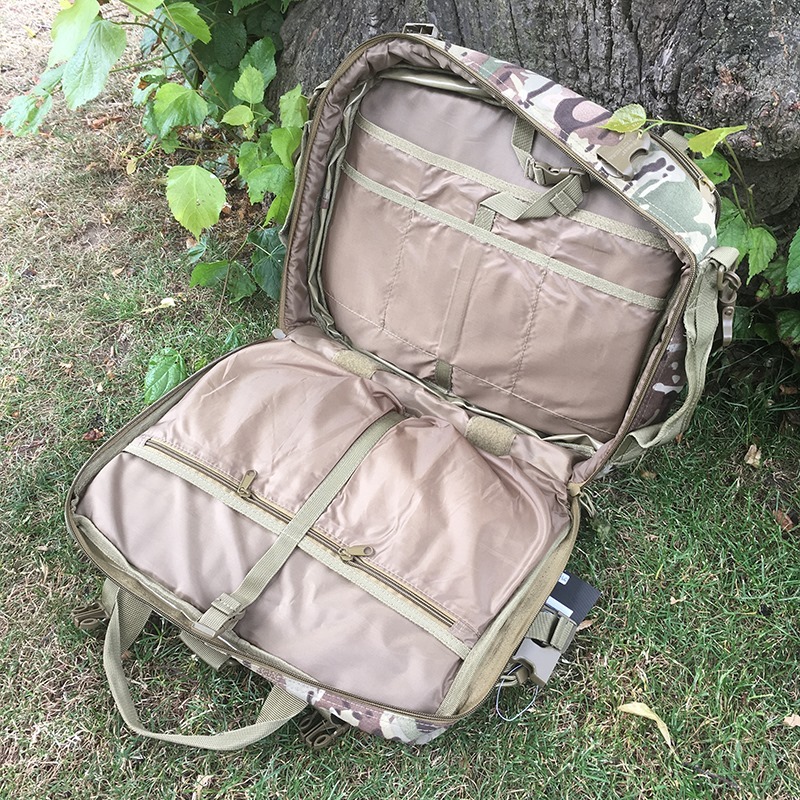 Coming in around the same size as a laptop bag this tactical 30L Bag can accommodate both a laptop and shed loads of kit inside! Made from 600D Cordura, It is available in a number of colours: Black, OD, Coyote and BTP Camo to suit you needs, be it an everyday sleek black laptop bag or a more military Camo bag. Externally the bag features 2 large utility pockets which are perfect for any small accessories such as pens, chargers, snacks or anything else you can think of. One of the outside pouches features a small ID panel alongside a huge piece of velcro real-estate to help you make this bag your own! On the other side, there is MOLLE Real estate meaning you can customize the bag even further if you need to do so. The bag also features 3! Thats right 3! carry handles alongside a padded shoulder strap making this bag easy to carry. Internally the bag features plenty of room for a laptop and note pads inside of the large internal compartment, which also features dividers to help keep all your equipment separated. Whether you’re off to a meeting, or securing some intel, the KUK Navigation Bag is a great choice! If you’re looking for something a little more inconspicuous then we have the KUK Small Messenger Bag! Available in a number of colours (Black, OD, Coyote, BTP) This 10L Bag is a fantastic choice if you want something to transport small laptops/tablets or even note books/sketchbooks. Designed to be worn over the shoulder using its padded shoulder strap, The bag features a large external flap which is secured using two small buckles. It also features a Velcro ID platform to really make this bag your own (All the patches!) alongside a zipped pocket for storage. On its reverse is an internal clear admin pocket for any notes or even maps which is visible when the bag is opened. The main compartment of the bag is fleece lined with a partition to help keep your possessions in check whilst on the move. 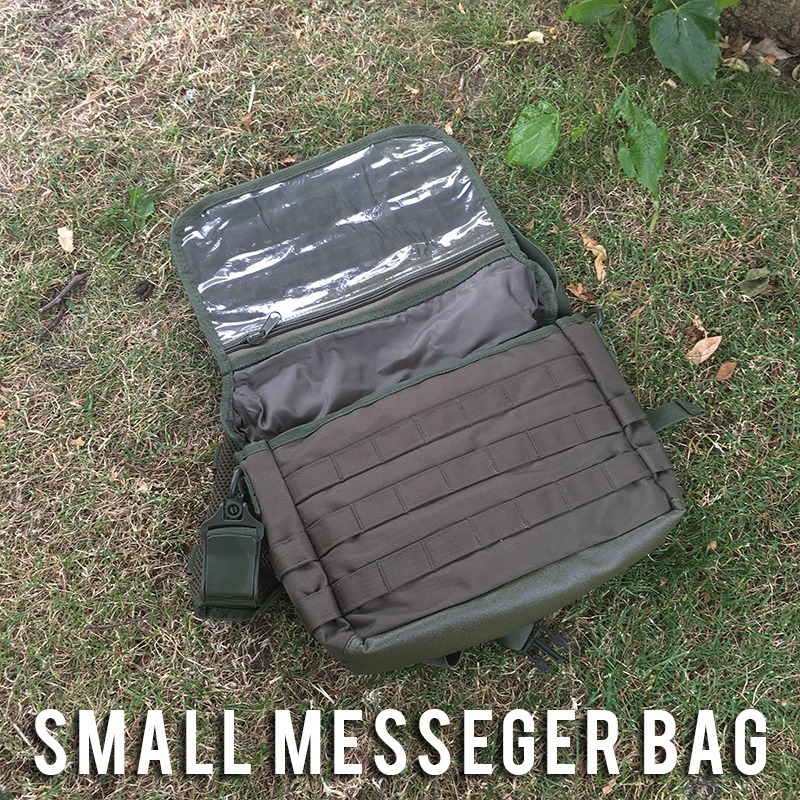 Keeping things tactical, this bag is also covered with MOLLE webbing on both the front and rear of this big you can easily add more pouches if you’re thinking of carrying anything extra. Perhaps the messenger bag is a bit small? 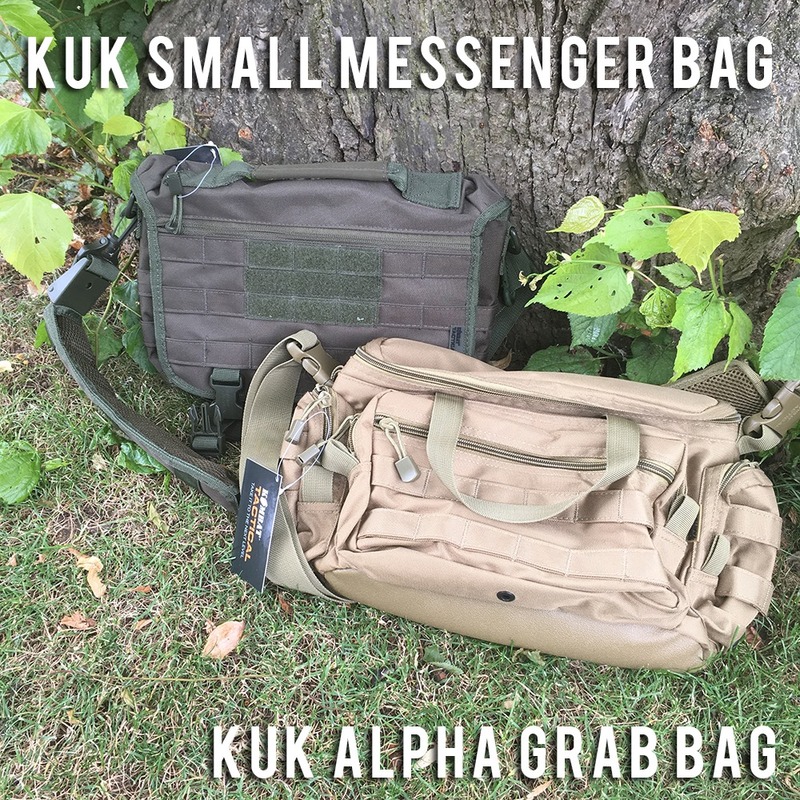 The KUK Alpha Grab Bag (Tan) With a carry capacity of 15 litres, doesn’t feel as overkill as the larger navigation bag, but still maintains functionality for transporting smaller items such as tablet devices. Accessible from the top of the bag is the large utility compartment, which comes with a number of dividers. Thefront of the bag features a large zipped utility pouch doubled up with an admin compartment for pens, notepads and any other small devices. 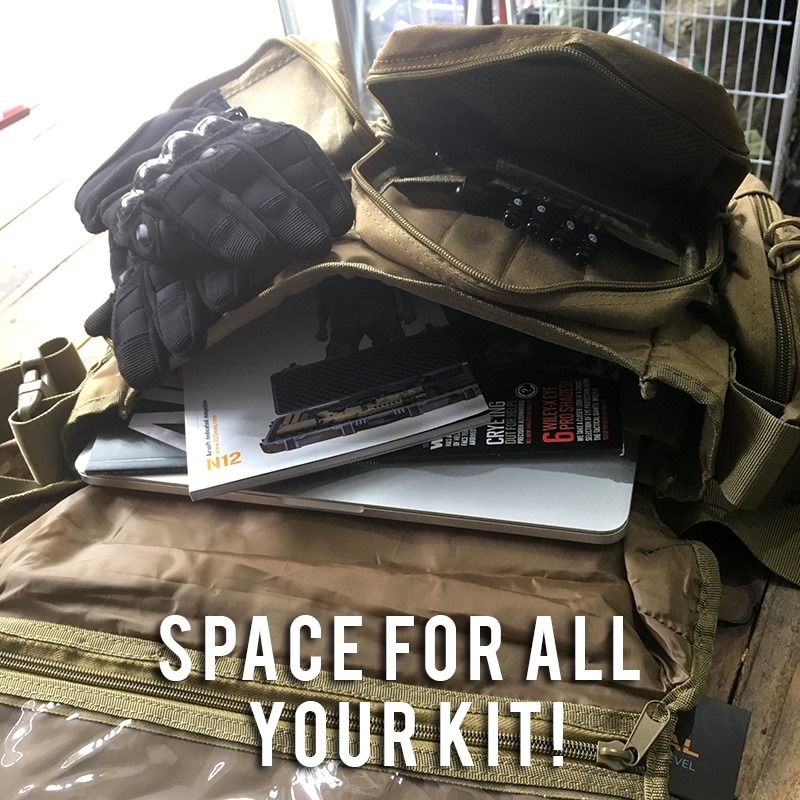 The sides of the bag also feature 2 small utility pouches giving the user plenty of storage room, but if that isn’t enough then the bag is also covered in MOLLE Webbing to allow further customization! 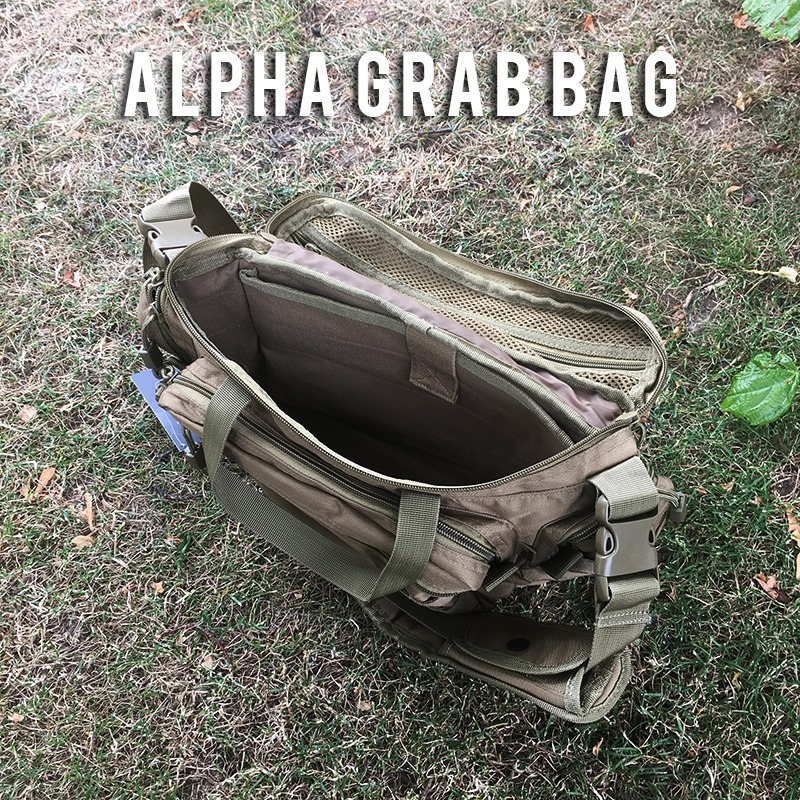 Equipped with both a grab handle and a padded shoulder strap, the Alpha Grab is the happy medium for those of you after something lightweight and easy to carry out and about. Switching back to the medium bags we have our final offering from Kombat UK, the Operators Grab Bag! because when you are operating out on operations operationally, even your bag needs to be operator! 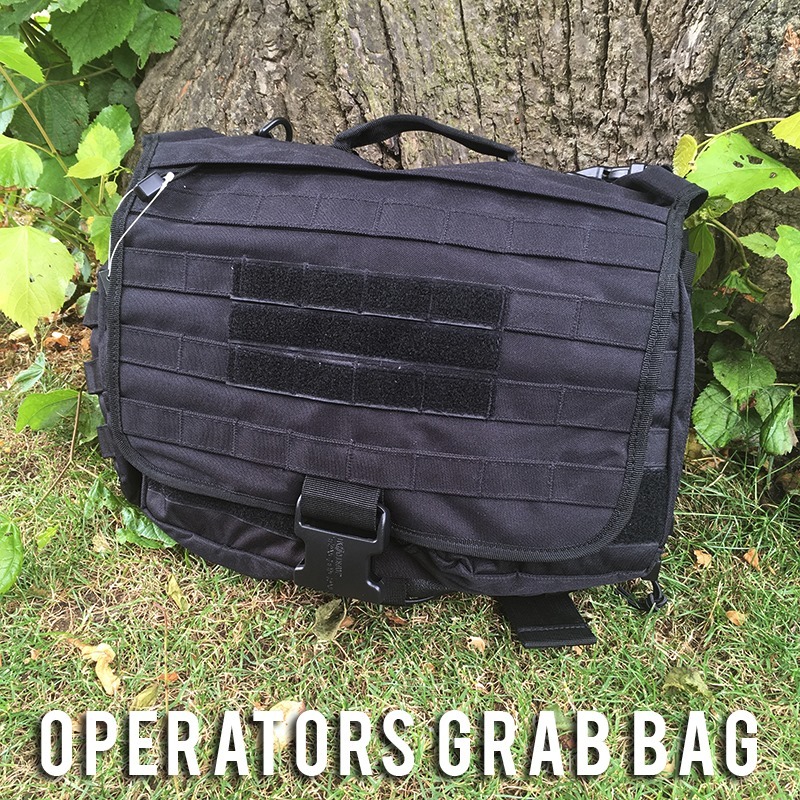 all jokes aside, The Kombat UK Operators Grab Bag is the perfect everyday pack that can be used by a variety of different personnel including operators,contractors, soldiers and police. The bag itself is absolutely covered in MOLLE real estate dominating the front and sides of the bag, with a large Velcro ID platform mounted to the large flap on the front. On the back the bag features a heavily vented surface with a built in zipped admin compartment. Once the flap is unclipped and open, the bag comes with two removable MOLLE utility pouches which can store a variety of things, ranging from personal effects, equipment and even handguns if needed. On the side is a slightly smaller Utility pouch which can also be used for any extra storage. The large central compartment is fleece lined and features partitions to help keep contents separated if needs be, with plenty of space for Gadgetssuch as laptops or even spare clothing! Being a slightly larger bag it comes with a heavy duty shoulder strap which can be unbuckled and stored if necessary allowing the user to carry it via the grab handle located on the top. So if you’re after something more spacious for your operator needs then perhaps you should treat yourself to the KUK Operators Grab Bag?